Previously recorded distance learning opportunities are available on-demand. Some of our most recent recordings feature information about various legislative topics and several sessions from the Planning and Budgeting Forum, which was held September 11–12 in San Diego. Legislative Lunchcast: A Washington Update From NACUBO. In September, we offered our fourth free 30-minute webcast designed to help business officers understand the political climate and explore potential budgetary, tax, and regulatory change. NACUBO’s Liz Clark, director of federal affairs; Megan Schneider, assistant director of federal affairs; and Bryan Dickson, senior policy analyst, discussed the wide-ranging implications of federal actions for students and institutions. Topics included the latest information on tax reform, Form 1098-T, gainful employment, immigration reform, and Pell grants. Planning and Budgeting Forum. The 2017 Planning and Budgeting Forum offered business officers opportunities to learn about the latest techniques in higher education resource management, with several selected for real-time, live video streaming. The NACUBO Live! Program offered a fully interactive platform that allowed individuals to ask questions, chat with other participants, and download materials. Using Academic Margins to Change Conversations with Faculty. Creating Transparent P&Ls to Expose Program Cracks and Enhance the Budget Process. Effectively Communicating Financial and Budget Information. Innovative Budget Modeling: Responsibility Center Management and Zero-Based Budgeting. These sessions will be available from Sept. 25, 2017–July 1, 2018. Participants who attended the meeting in San Diego, and those who joined the online event, will have access at no additional cost. To register, visit www.nacubo.org/DistanceLearning. 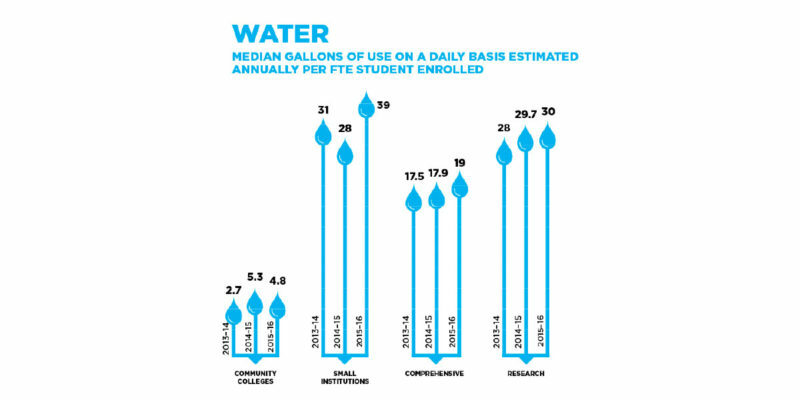 The Key Facilities Metrics Survey, which captures key consumption data, BTU (energy), electrical, water, waste (recycle and garbage), and carbon, allows higher education leaders, faculty, staff, and students to make decisions that will improve the campus ecology and footprint. The survey, now in its fourth year, is open to all institutions and will close on December 11. To participate, visit www.appa.org/research/nacubo.cfm. To view results from previous years, visit www.appa.org. How Does Your SFS Office Compare? 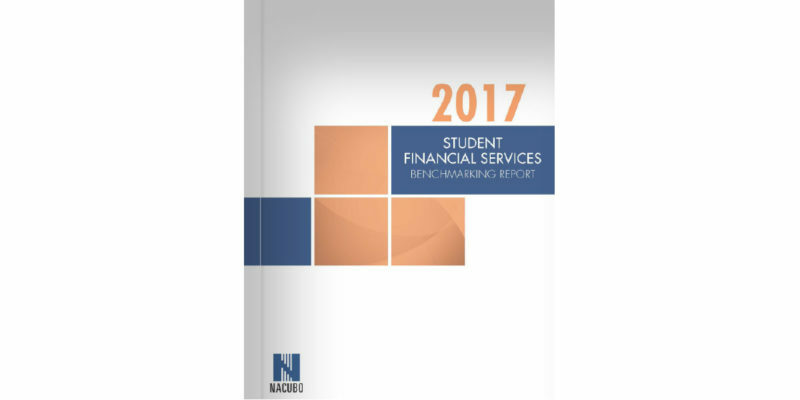 On Monday, September 11, NACUBO released the 2017 Student Financial Services Benchmarking Report. This annual report provides the survey results of institutions’ student account and loan receivables, payment channels, credit balance refunds, third-party payments, staffing, and student financial services expenditures from FY12 to FY16. Now in its ninth year, the SFS benchmarking project has become a key component in our efforts to help institutions compare their key financial indicators against national averages and self-selected institutional peer groups. Purchase your online copy today in the products section of www.nacubo.org. The cost is $50 for members and $200 for nonmembers. 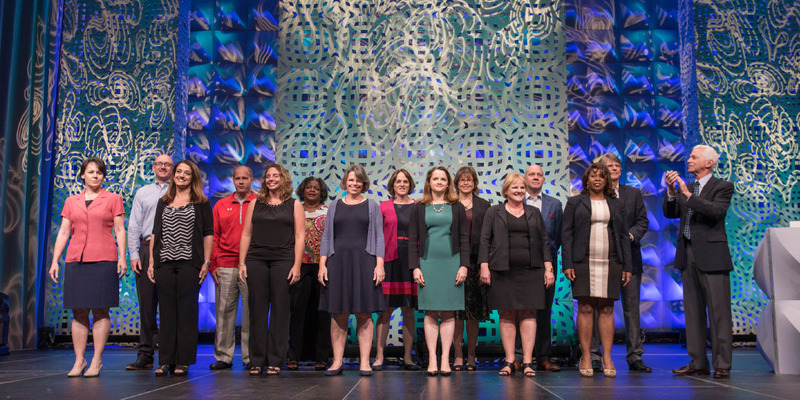 NACUBO has long honored individual and institutional excellence through its awards program. Over the years, the association has recognized individual winners for their achievements in professional development, tax, and accounting, as well as distinguished business officers and rising stars who have exemplified expertise in the field. These awards encourage excellence and promote the recognition of outstanding individuals in higher education business office operations. After a full review by the NACUBO Board of Directors and staff—and in an effort to diversify the award categories—the awards program is undergoing several changes. Most notably, topic-specific individual award winners will now be recognized during the professional development program related to the award. This change will allow winners to receive their awards in the presence of their peers. In addition, NACUBO created a new category for excellence in student financial services. These changes will be implemented during the first quarter of 2018 programming. Rodney H. Adams Endowment Management Award. This award, which recognizes outstanding individual contributions to professional development activities related to university endowment and investment management, will be distributed during the 2018 Endowment and Debt Management Forum, to be held February 7–9 in New York City. Daniel D. Robinson Accounting Award. Awarded during the 2018 Higher Education and Accounting Forum, to be held April 15–17 in Kansas City, Mo., this award recognizes individuals who demonstrate leadership and a continuous commitment to the advancement of college and university accounting and reporting. The all-new Student Financial Services Award will recognize and honor individuals who display an outstanding commitment to the higher education community, NACUBO’s advocacy efforts, and educational programs and publications related to student financial services. The inaugural award will be distributed during the 2018 Student Financial Services Conference, held March 11–13 in Orlando, Fla.
Do you know a dynamic and outstanding colleague in the areas of endowment management, accounting, or student financial services? If so, consider submitting a nomination that details their contributions and highlights their achievements. Nominations for these awards close on November 3. The NACUBO Awards program remains in development, and further updates to the format and award categories will be announced in the coming months. Nominations will open in the spring. To learn more about the new awards format and to submit an application, visit www.nacubo.org and click on “NACUBO Awards” under the “Membership and Community” tab. At its July meeting, the NACUBO Board of Directors approved funding for several new initiatives related to the strategic blueprint for the association. After the blueprint was approved in March, NACUBO staff began the process of evaluating current programming, assessing future needs, and developing new initiatives to better serve the NACUBO membership and meet strategic priorities. Based on this research, during the July meeting, the board approved funding for several of the new initiatives proposed by staff. Over the next two years, NACUBO will roll out new programs and resources that will help improve campus decision making and give business officers additional tools to meet their institutional mission. Enhanced leadership programs for next-generation business officers. Micro-learning offerings that will allow business officers to quickly close skill and knowledge gaps. New resources emphasizing data-informed decision making. Additional advocacy-related efforts that will provide timely regulatory and legislative updates. Ongoing collaborations and partnerships with other higher education associations. The launch of the NACUBO Economic Models Project website. The inaugural cohort of NACUBO Fellows celebrated the closing of its program year at the NACUBO 2017 Annual Meeting in Minneapolis. Over the course of the year, the 15 NACUBO Fellows worked together and with higher education leaders to deepen their knowledge of business management, institutional communications, and the CBO role. The Fellows also enhanced their leadership skills as they learned about the core competencies needed to succeed as CBOs. For their culminating project, the Fellows collaborated in small groups to address an institutional challenge in the form of a case study, and prepared solutions for presentation to a mock “executive council” that included five NACUBO board members. The way business officers communicate the value of higher education is more critical now than ever before. The media landscape has changed, policymakers are scrutinizing the higher education sector, and public pushback continues—on rising college costs, student debt loads, and workforce challenges, to name a few. To help business officers communicate these important messages, NACUBO has launched the Value of Higher Education initiative, which aims to counter the negative discourse surrounding higher education’s true value, promote its myriad benefits, and shape public opinion toward a more positive perception of higher education’s significant contributions to individuals and to society. Business officers are well positioned to articulate the value of colleges and universities to students, communities, and employers—and many tell NACUBO that communicating college costs is an increasingly important part of their jobs. 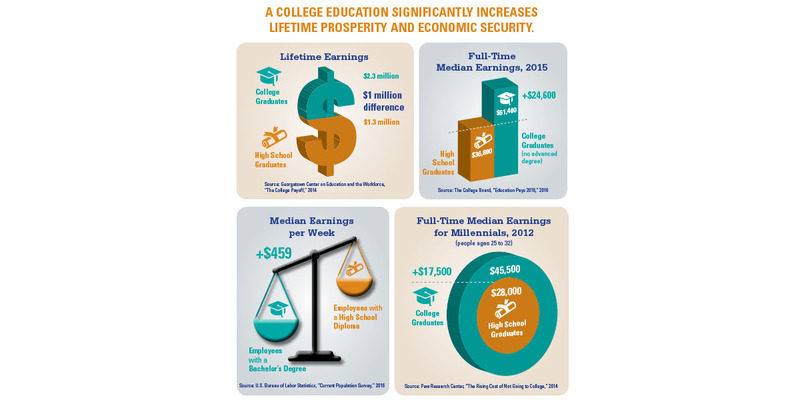 The new materials provided by the Value of Higher Education initiative include data-rich infographics, a downloadable PowerPoint presentation, and a number of student success stories. Go to www.nacubo.org to obtain these materials in support of your advocacy for higher education and its value. Significantly boosts a student’s annual and lifetime earnings. Results in a much lower likelihood of unemployment. Increases the level of retirement security. Inspires individuals to volunteer and to vote. Results in increased tax revenues. Leads to increased giving to charities. Contributes to a longer lifespan. Alters future generations in positive ways. 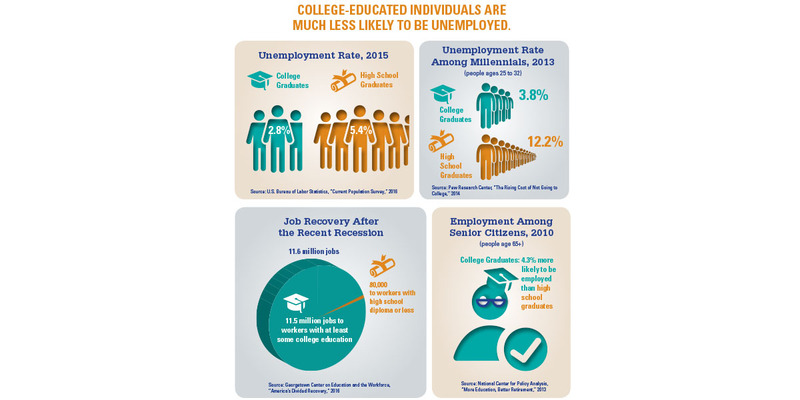 Following are some examples of the infographics that offer a snapshot into the many elements affected positively by a college education.